Washington (CNN) - Some leading national Tea Party organizations are anything but happy with Friday night's deal on the budget that prevented a federal government shutdown. 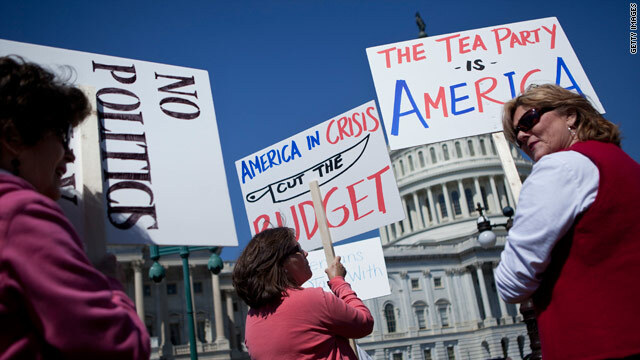 A spokesman for the Tea Party Express tells CNN the group isn't "very impressed" with the budget deal and says the agreement proves the Tea Party has a lot more work to do to make deeper cuts in the federal budget. "According to the Congressional Budget Office, the U.S. budget deficit in the first six months of the current fiscal year totaled $830 billion. So you can imagine we're not very impressed by a deal that cuts an almost trivial $38 billion," says Tea Party Express spokesman Levi Russell. "It just shows that the Tea Party has a lot more work to do in ousting the spending-addicted liberal Democrats who refuse to stop acting like selfish children incapable of making the tough decisions voters have demanded." Tea Party Express, one of the most well known and politically active national tea party organizations, is teaming up with CNN for a first of its kind Tea Party debate featuring GOP presidential candidates and scheduled for early September in Tampa, Florida, the city that's hosting the 2012 Republican National Convention. While the Friday night agreement will avert a government shutdown by funding the federal government for the remainder of the 2011 fiscal year, major showdowns over raising the government's debt ceiling and hammering out a budget for the 2012 fiscal year are looming. "The Tea Party has a lot more work to do, and we're focused on 2012 more than ever," adds Russell. A similar message comes from FreedomWorks, a nonprofit conservative organization based in the nation's capital that helps train volunteer activists, has provided much of the organization behind the Tea Party movement, and which supports conservative candidates in Republican primary and general election contests. Adam Brandon, a spokesman for the group, says the just-concluded budget fight is only a preview for the real battles ahead. He tells CNN, "The battle lines are clearly being drawn, and it's up to the Republicans to make the tough spending cuts." Brandon adds that the deal to avert a shutdown illustrates the Tea Party movement's influence, saying, "The conversation's turned from whether to cut to how much to cut." While there was talk of the battles to come, there's also more disappointment with the deal. Mark Meckler, co-founder of the Tea Party Patriots tells CNN, "In February the government incurred a historic high $233 Billion deficit. Last night, at best, they agreed to cut $38.5 billion in spending over the next six months. Are we disappointed? We think those numbers speak for themselves. This country needs bold and visionary leadership, something that seems sorely lacking in those 'leading' today. The fight will continue in the days and months ahead, and Tea Party Patriots is in it for the long haul." Asked if the group might urge members of Congress to vote no, Tea Party Patriots co-founder Jenny Beth Martin tells CNN, "We won't make any calls for action before Monday. As always, we need to consult with our local coordinators." And Rep. Michele Bachmann says the agreement "is a disappointment for me and for millions of Americans who expected $100 billion in cuts." The Minnesota Republican, who is chair of the House Tea Party caucus and is seriously considering a run for the GOP presidential nomination, adds that, "Sadly, we're missing the mandate given us by voters last November, and for that reason I voted against the Continuing Resolution." More dissent comes from Judson Phillips, head of the Tea Party Nation, the group that last year put on the first national Tea Party convention. Phillips, who has been very critical recently of House Speaker John Boehner's actions when it comes to the budget, asks in an email to supporters, "Can someone please tell me how this is anything other than John Boehner hauling up the white flag because he is unwilling to fight? Can anyone please tell me how this is anything but a complete victory for the liberal Democrats, who want to keep spending this country into bankruptcy and poverty?" While most recent polls indicated that a majority of Americans wanted congressional lawmakers to compromise rather than to stick to their guns on the budget, even it if meant a government shutdown, the same surveys indicate a partisan divide. An NBC/Wall Street Journal released Wednesday indicated that 68 percent of Democrats said they want Democratic leaders in Congress to make compromises in the current budget battle, with 56 percent of Republicans, and 68 percent of self-described Tea Party supporters, wanting GOP lawmakers to stick to their positions, even if it leads to a shutdown. "the tea party IS america"
if by America they mean racist white people over that age of 45 who are out of touch with the real world. The Tea Party folks are a bunch of illiterate, toothless morons who try to bully America from the comfort of their trailer homes. Earth to the T buggers-IT ANT GONNA HAPPEN!!! While the Tea Partiers are entitled to their opinion so our the rest of us. This group embodies the perfect definition of a school yard bully. Do they think the rest of us are so stupid as to not know there is a budgetary debt crisis? The way to handle it is through compromise, which the majority of Americans want, and working together in a bi-partisian manner, NOT by bullying tactics of "my way or the highway". The Tea Party is going to get a rude awakening in 2012 because it's going to be America's way and the Tea Party can hit the highway! It all about the tea party. They should all be charged with treason. For trying to bring the downfall of our govt. Until the tea partiers start saying "yeah, we can cut some military spending as well", everything they champion should really be ignored as the insane base of a party which holds the idea of compromise in disdain. "Lower taxes for the rich, fewer social welfare programs, and still make sure our military budget is over half a trillion dollars a year." How we can be targeting social cuts without championing military cuts just as strongly is well beyond me. I think salary cuts across the board for all elected officials and make them pay for their own health care is a great place to start! Cut their staff's in half is another recommendation. When making cuts, it should be felt across the board, not just the middle class and lower income people and seniors. In other words, let's make the rich pay a little extra, they certainly won't feel it in their pocketbooks. Michele Bachmann was for it before she was against it. She is changing her story now because the Tea Party leaders are against it. As the GOBP gets dragged further to the extreme right and further towards a fantasy-based, rather than reality-based world view, the more independents are left with little choice but to vote for the Democratic Party. If the Tea Party is not happy, I am very happy! As soon as the TP starts talking about taxing billionaires and corporations I`ll start to take them seriously. Until that happens they are just a bunch of noise spouting ring-wing platitudes that mean nothing. Corporations used to pay 30% of all taxes. Now they pay 6.6%. If you want to put a dent in the debt you have to have the billionaires helping out. Will that tank the economy? No. There is no evidence to support that bumper sticker.Angry and misinformed is no way to go through life. Where was the Republican Party and the Tea bagger during the Bush years which is the root cause of the deficit.